Muang Ngoi Neua is no longer an unfamiliar name to tourists, a little sleepy town nestled between mountains and the river attracts tourists by its pristine beauty and the laid-back lifestyle. 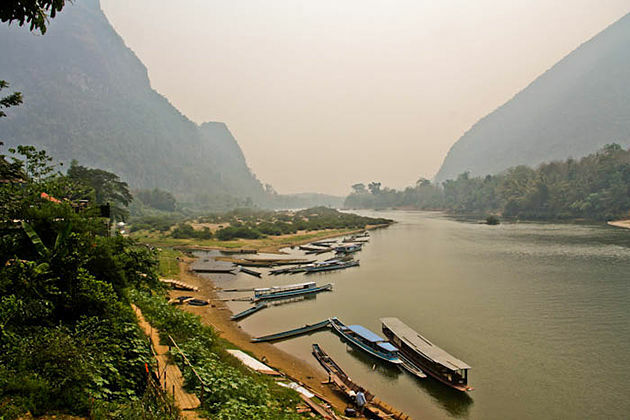 Muang Ngoi Neua is an ancient town, which features the northern Laos style on the bank of the gentle river Nam Ou. Previously, Muang Ngoi Neua was always closed and embraced the simple and traditional lifestyle, but in recent years, it has been known by many foreign tourists especially backpackers by its pristine condition and tranquility. 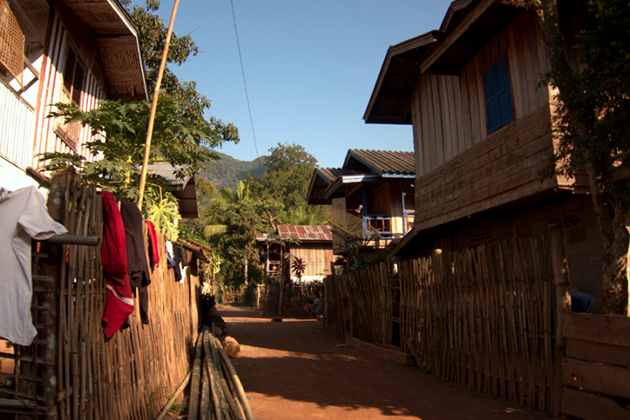 It takes all morning to pass the long way from Luang Prabang to this village. 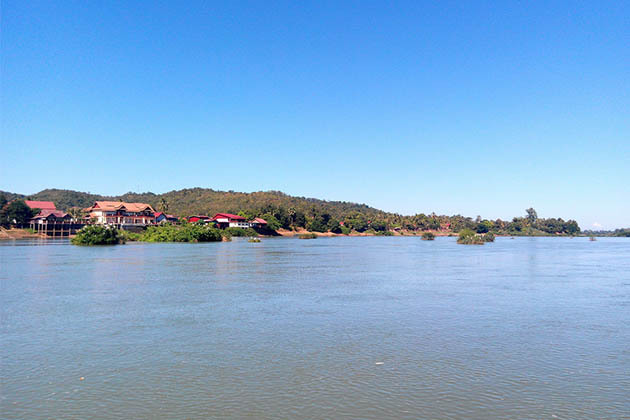 Along the Nam Ou river, tourists will be overwhelmed by a variety of beautiful ancient town. Tourists float on Nam Ou river, enjoy the light breezes cooling your face and the tranquility in your soul. All the peaceful majestic scenery of the mountains and the tenderness and quietness of the ancient villages are captured in your eyes. After the long way 150 km, the little village appears, one side is the lush green mountains and the other is the fertile river. 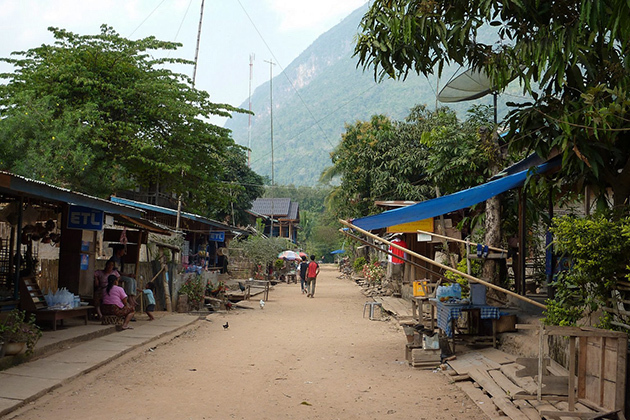 Enter this town, there is a little bustling, which differs from several years ago since Muang Ngoi Neua has changes itself to serve tourists. Many restaurants, guest houses have been sprout up in the village, but it still keeps its unique pristine beauty alive. Come to this village even just for a day, you will feel like you are back in time to the childhood: cutting off the electricity alternatively, the closeness between people, the laughing of innocent children and especially no motorbikes, no cars, no trace of man-made clatter. The best idea is to hire a bike and ride it around the village slowly to immerse in nature and feel the laid-back Laos life. You can also roam and visit other villages and have a trekking mountain. Muang Ngoi Neua is not modern or luxury, you just stay in some very simple bungalows or guest houses but it is still charming and attractive. Let’s come here and find some peaceful moments for yourself. Muang Ngoi Neua is beautiful but fragile, it needs to be loved and protected its tranquility by the local and every tourist who falls in love with this sleepy little town. It should not be changed too much or destroyed by tourism. By all means, visit this adorable village and enjoy what it has to offer for you. There is some of the street stall food and it is absolutely amazing as you can imagine. Coconut and sticky rice balls with spring onion, fried banana crisps, and gooey sticky rice cakes will energize your day. You can hire a boat and keep rowing on the river to explore other spots. There is an excellent hiking path originating from the south of the village, you can find Tham Kang and Tham Pha Kaeo. The cave is remained its natural look, no lightbulbs, no trails, entering the cave, you maybe need a local guide and explore by your instinct, but don’t go too far. For the more adventurous, you venture to the 130-foot waterfalls of Tat Mok. It takes a half-day to go and return so it requires a boat ride and a hike into the fall. If you want something more soothing but exciting, trekking to a high spot through some prickly shrubs to watch the gorgeous sunset over the Muang Ngoi Neue’s stunning landscape is a great idea. 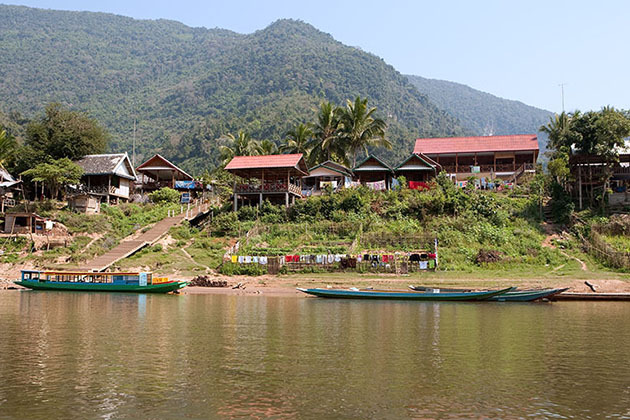 Tourists can take a bus from Luang Prabang to Nong Khiaw then have an hour by boat down the river. Don’t forget to bargain since the sailors may push the price many times, it is better to be 10.000 kips to 30.000 kips per person.